Create between 3 or more books/book blogging goals. I struggled with this challenge in the past and hope that this round I will be sucessful. 1. 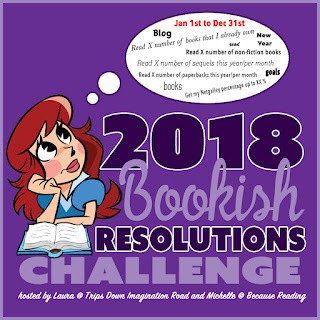 I didn't reach my goal of 250 books in 2017 so I hope 2018 will be my year. 2. Finish all my reading challenges. 3. Read 24 of my backlogged review books. 1. Post more discussion posts aiming for 20 at least. These aren't insane goals but something I want to work harder on. I need to refocus on my bullet journal as well. I've been so distracted and busy lately I just can't.